newest, most amazing SiriusXM experience ever. And it's already yours - just turn on your radio. Over 200 channels–the most ever offered in any vehicle. Plus free On Demand shows, performances and interviews–right in your truck. Personalized recommendations, easy-to-navigate categories and voice search help you quickly find what you love, and pause and rewind put you in control of it all. And that’s just the beginning. Pop, country, rock, classical, alternative, punk, reggae, oldies... Whatever it is, your favorite music is right here. To help you find even more of what you love, we'll recommend other channels, artists and shows based on what you listen to. And the recommendations don't stop at music. We'll personalize picks for you in entertainment, talk, sports, whatever you love hearing. Listen to their biggest hits, along with songs and performances you didn't even know existed - all on our exclusive artist-dedicated channels. The biggest stars and best entertainment live - or whenever you want. There's something for everyone. TODAY Show Radio, SiriusXM Patriot, The Catholic Channel. Tune in for politics, lifestyle, gossip - even kids' programming. 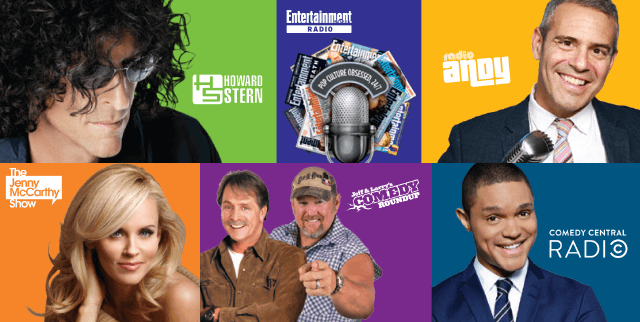 Hear the biggest personalities like Howard Stern, Andy Cohen, Jenny McCarthy and so many more. Check out Comedy Central Radio, Raw Dog Comedy, LaughUSA and more, including family-friendly channels. Miss a conversation with your favorite artist or celeb? Wanna hear that hilarious comic again and again? We’ve got you covered. Your All Access trial includes over 5,000 hours of On Demand content–interviews, performances, shows and more you can hear right in your vehicle–whenever you want. Want suggestions? We’ll include them in your Personalized Recommendations. Miss a conversation with your favorite artist or celeb? Wanna hear that hilarious comic again and again? We’ve got you covered. Your All Access trial includes over 5,000 of On Demand content–interviews, performances, shows and more you can hear right in your vehicle–whenever you want. Want suggestions? We’ll include them in your Personalized Recommendations. More games, more sports, more coverage and now your team's just one button away. It's even easier to be a sports fan. We’ve put all the live sports in one category so you can quickly find the games you need to hear right now! Keep up with your favorite team, no matter where you are. Hear live coverage of every major pro and college sporting event. And stay in the know with expert analysis on league-dedicated channels, plus the best sports talk 24/7 on Mad Dog Sports Radio, Barstool Radio, ESPNU Radio, and Fantasy Sports Radio. The most complete news coverage. We've teamed up with world-class providers to bring you live, breaking coverage, 24/7. Follow financial markets and keep up with every topic on public radio. Plus, you'll get regional traffic and weather updates. Streaming's included in your trial. So you can love your SiriusXM favorites everywhere. Enjoy over 200 SiriusXM channels online and on the go with the SiriusXM app. Plus listen at home on a wide variety of connected devices you may already own including smart TVs, devices with Amazon Alexa, Apple TV®, Roku®, Sonos® speakers and more. Get your streaming login here. Avoid traffic while you jam. You've got coast-to-coast, best-in-class traffic information with continuously updated incident coverage and alerts on major accidents, construction and road closings. Find out what’s happening with the weather and the game as well as fuel prices for area gas stations; movie theater listings, start times and ratings; and electric-vehicle charging station locations. Check the Welcome Kit we’ve sent for all the details you need. Or, log in to see what’s included and when it ends. How else can I manage my account? By logging into your online account you can update your info, add radios, manage payments, and easily refresh your radio. Yep! Just call us at 1-855-599-5618 if you have a question, need help or just want to learn more about SiriusXM and your trial. Be sure to check out the FAQ section below for quick answers to common questions. Amazing happens here. All the time. Start exploring. What channels do I get with my All Access trial subscription? SiriusXM with 360L coupled with the All Access trial subscription provides you with the most SiriusXM channels ever offered in-vehicle. That’s because SiriusXM lets you hear every satellite channel we offer – PLUS extra streaming channels normally available only online and on our app. Your RAM 1500 includes our very best subscription package, the All Access package. It has the most channels and the most features and flexibility we offer — and it's all yours to enjoy for 12 months, at no cost or obligation to you. Your vehicle may also include a trial subscription to one or more Infotainment services from SiriusXM. 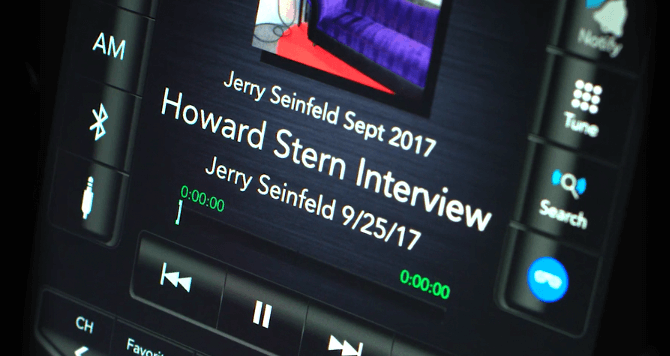 Are SiriusXM ‘Infotainment’ services included with my trial subscription? 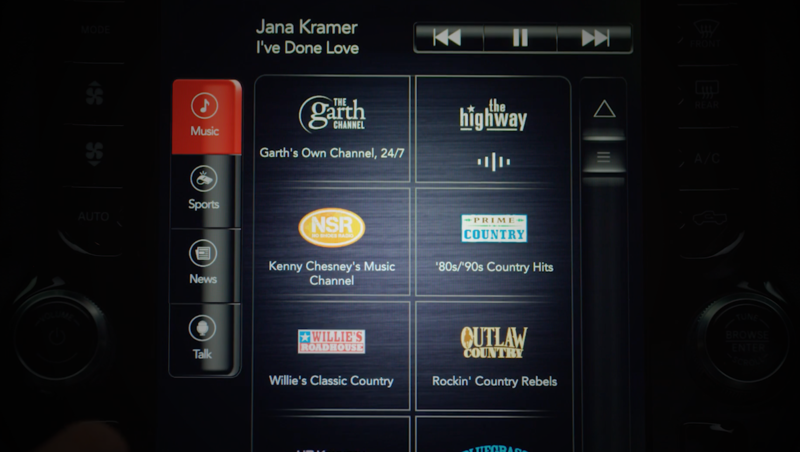 Your RAM also comes with a trial subscription to SiriusXM Travel Link, SiriusXM Traffic Plus and SiriusXM Guardian™ Connected Services. These are in addition to your 1-year All Access package trial subscription. SiriusXM Travel Link helps to make every trip more efficient. New RAM owners will enjoy a five-year trial subscription to services like local fuel prices, national weather information, sports scores and movie listings. SiriusXM Traffic Plus works with the vehicle’s navigation system to display traffic speed, flow information and accident information to assist drivers in routing around congested areas. I love having the SiriusXM All Access trial subscription in my car. How can I listen in other places too? Your All Access trial subscription includes streaming on the app, online and on a wide variety of connected devices in your home, including wireless speakers, smart TVs, home audio systems and media players, so you can enjoy our favorite programming in and out of your car. To get started, first download the app to your smartphone or tablet or computer. Then, set up your streaming username and password which allows you to log in to listen. You can also view a full list of devices you can stream SiriusXM on. How will I know when my 1-year All Access trial subscription is ending? Look out for the Welcome Kit we’ve sent you, which includes information about your trial subscription, your Customer Agreement, and when your trial will end. No. Your trial subscription is just a trial — it's yours to enjoy for the duration. Of course, we hope you'll love it so much you choose to subscribe to keep enjoying all our great programming. 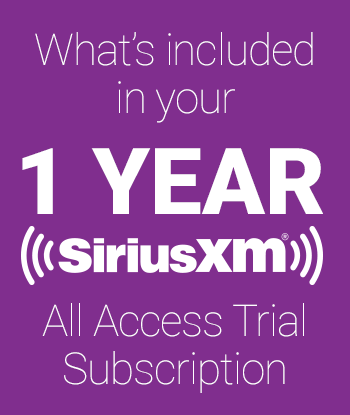 If you have not yet purchased a subscription package for after your trial ends, your SiriusXM service will automatically stop at the end of your trial period. You can subscribe at any time during your 1-year All Access trial subscription. If I want to go ahead and subscribe now, will I lose what's left of my trial subscription? No. Subscribe now (or at any time during your trial) and you will still enjoy every bit of your trial time. You will NOT be charged for the package you choose until your trial is over. You can subscribe at any time during your 1-year All Access trial subscription. You can subscribe now (or at any time during your trial) and you will still enjoy every bit of your trial time. Your paid subscription for the package you choose will not begin until the end of your trial, and you will not be charged until that time. Tip! You'll have a variety of subscription options available to choose from, but to continue enjoying all the great channels and features you're now getting with your trial subscription, be sure to pick a subscription to the All Access package. If your vehicle includes Infotainment services, these are not included with the All Access package so you'll need to purchase those separately. Once you subscribe, you can cancel at any time by calling 1-866-635-2349. Subscribe now — or at any time during your trial — so you don’t have to remember to do it later. Be sure to have your Radio ID/ESN handy — and remember to pick the All Access subscription package to keep everything you're getting now. You can add your new car to your account, remove any old radios you no longer have and transfer unused service from your old car to your new one. (Certain restrictions apply.) Our online service is available 24/7 and is easy to use. And you won't lose any of your trial subscription when you transfer your service. If you need additional assistance, our dedicated Loyal Listener care team is here to help. Just call 1-855-290-6596. Can I subscribe from my vehicle using SiriusXM with 360L? Yes! We have put the control at your fingertips and in the vehicle. You can subscribe at any time during your 1-year All Access trial subscription. or tap the Subscribe button to begin, once you’re safely parked. What is new and different about SiriusXM with 360L? What vehicles have SiriusXM with 360L? Select RAM vehicles will have SiriusXM with 360L. Additional vehicle brands, makes and models will be available in 2019 and beyond. How do I find On Demand shows or episodes using SiriusXM with 360L? On Demand content lets you listen to content on your own schedule, without having to tune in at any particular time. Step 1: Tap on Search on the right side of the screen. Step 2: Speak the name of the channel, show, artist or episode you’d like to hear. Step 3: Tap the On Demand Show or episode tile from the Search Results page to see available content. Step 1: From the Now Playing screen, tap the Related button on the horizontal navigation bar. Step 2: Select the On Demand episode you would like to hear. The Related button will be greyed out if there is no related content. What is the Recommended For You feature on SiriusXM with 360L? The Recommended For You feature displays personalized recommendations of channels and On Demand shows and episodes based on the profiles’ listening history. Step 1: Tap the For You button at the bottom of the screen. Step 2: Scroll through the recommended list and choose the content you’d like to hear. What does creating a listener profile do for me? SiriusXM with 360L allows you to create up to five listener profiles. This allows the driver, the co-pilot and even the backseat driver to set up their own unique listening experience with an individual listening profile. Each profile gets their own SiriusXM favorites, personalized recommendations, listening history and more. Step 1: Tap the Profile button on the right side of the screen. Step 2: Tap the Add Listener button. Step 3: Choose the image and add a name that you want for your profile. How do I add and remove Favorites using SiriusXM with 360L? You can add channels, On Demand shows and sports teams as Favorites so you have quicker access to the content and shows you love. 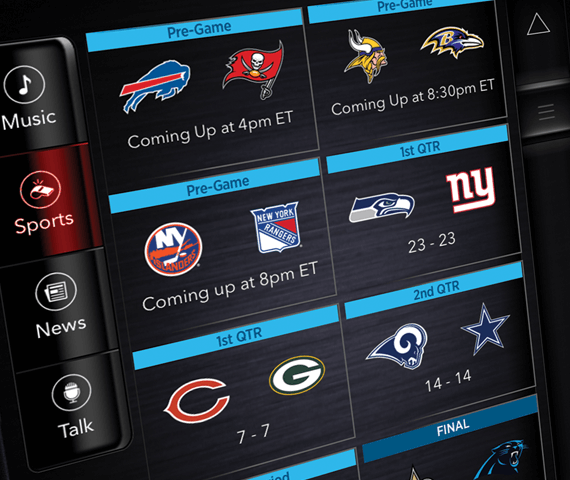 Tap and hold channel, On Demand Shows and sports team logos from any SiriusXM screen to add them as SiriusXM Favorites. When you set up a listener profile, your favorites become a part of your profile. How can I see my listening history on SiriusXM with 360L? Listening History shows you the channels, On Demand episodes content you have recently listened to. Step 2: Be sure you are using the correct profile, then tap on the Listening History button. How can I manage my SiriusXM account from my SiriusXM with 360L radio? We’ve given you the ability to manage your SiriusXM account where you listen the most – in your SiriusXM with 360L-equipped vehicle. Step 1: Tap the Profile button in the vertical navigation bar on the right side of the screen. Step 2: From the top of the Profile and Settings page, view the how many days you have left until your trial expires. Step 2: From the Profile and Settings page, tap on the Manage Account button. How can I block explicit content on SiriusXM with 360L? You can set up a block on explicit language (XL) channels and shows for any listener profile that you set up in your SiriusXM with 360L-equipped vehicle. This allows you to ensure little or sensitive ears hear only what’s right for them. Step 2: Ensure you are using the correct profile, then tap the Listener Settings button. Step 3: Once on the Listener Settings page, toggle the Block Explicit switch to the ON position. How can I find my SiriusXM with 360L Radio ID? Every SiriusXM radio has an identification number that is used to register radios and set up accounts. Step 2: From the Profile and Settings page, tap on the Contact SiriusXM button. From the Contact SiriusXM page you can see your Radio ID and telephone support phone number should you need to contact Customer Care. If your phone is connected to your vehicle, tapping Call SiriusXM will dial SiriusXM Customer Care. How do I exit Demo Mode?